If there is one fact that I can be certain of now and into the future, it’s that I will always be a huge Adventure Time geek. I’ve got the series boxsets, the figurines and the LEGO. I’ve got a tattoo spanning the length of my forearm, and at an undisclosed period of time (well into my 20s) I even rocked an Adventure Time bedspread. Through all this, there’s one thing that I’ve wanted more than anything else, and that’s a proper Adventure Time game. Of course there have been numerous games based on Cartoon Network’s much-loved animation in the past, but these have mostly been either stock-standard mobile games or smaller and unambitious attempts at handheld and console titles. WP: First of all thank you for your time, and congrats on the recent announcement of Adventure Time: Pirates of the Enchiridion. I don’t know what the reception looked like from your end but I’m personally very excited. How does a licensing deal like yours with Cartoon Network come about? Who approached who? OA: Outright Games and Cartoon Network were speaking before they went on the search for a developer to bring the next Adventure Time game to life. After that, they approached us as a studio with a proven record to do exactly that. WP: Are there many Adventure Time fans on the development team? OA: I’d say a majority of the dev team are fans of Adventure Time, especially amongst the artists and designers (and even our CEO!). I know several of us who are completely up to date on the show. I myself requested to get put on this project specifically because I’ve been an AT fan for several years. 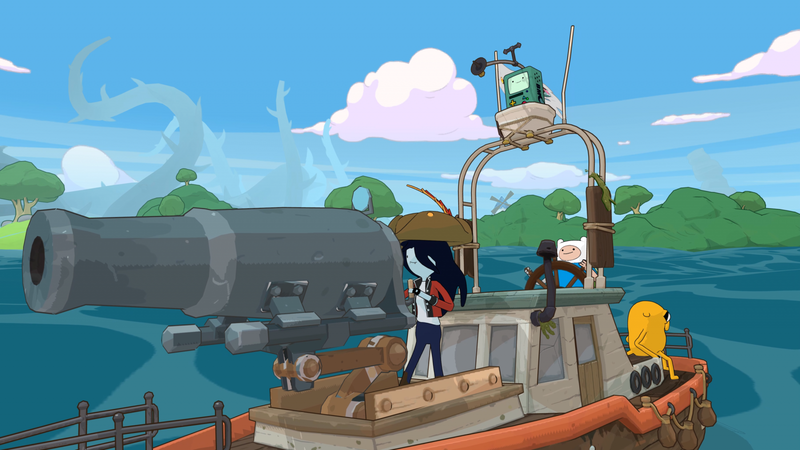 It’s been a huge help with bringing the world of Ooo to life in-game. WP: What’s your relationship like with the show’s creators? Is there a lot of back-and-forths when it comes to creating something in their universe? 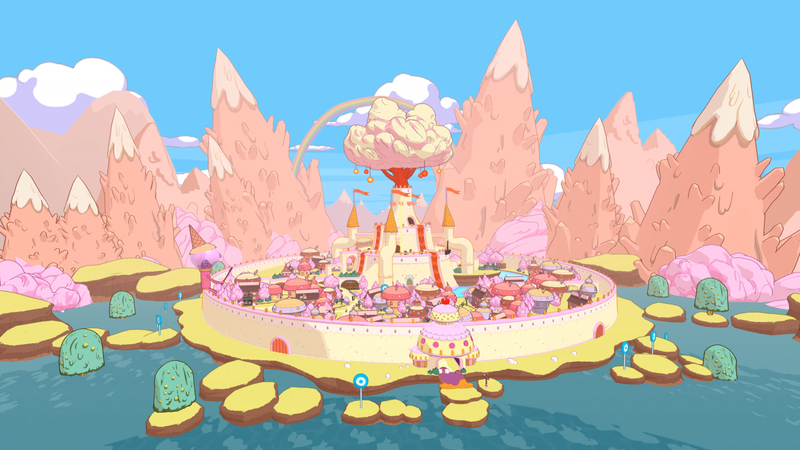 OA: We have very regular meetings with Cartoon Network to make sure the game looks, feels, sounds and tastes just like the original universe. It’s been a smooth relationship as both sides are passionate about making sure the game does AT justice. Wind Waker was definitely a solid frame of reference when we were looking at how the boat would function and feel on the open sea. I’d like to tell you more, but the guys at Outright are getting ready to show you the world in a far more interesting way than I could. WP: On that, you’re promising a brand new storyline voiced by the show’s cast, is that all written in-house or does it mostly come from the show’s writers? OA: The core of the story was written by Dave Ellis, who has previously worked on several game titles including a past Adventure Time game. Beyond that, we also have several additional elements such as in-game character lines written by our design and audio teams in-house. OA: Wind Waker was definitely a solid frame of reference when we were looking at how the boat would function and feel on the open sea. I’d like to tell you more, but the guys at Outright are getting ready to show you the world in a far more interesting way than I could. WP: Honestly, an open-world game set in the Land of Ooo has always been a dream of mine. Just how much of Ooo is there to be explored in Pirates of the Enchiridion? OA: You’ll find the game contains both a mix of familiar landmark locations and some original places building on the existing universe. 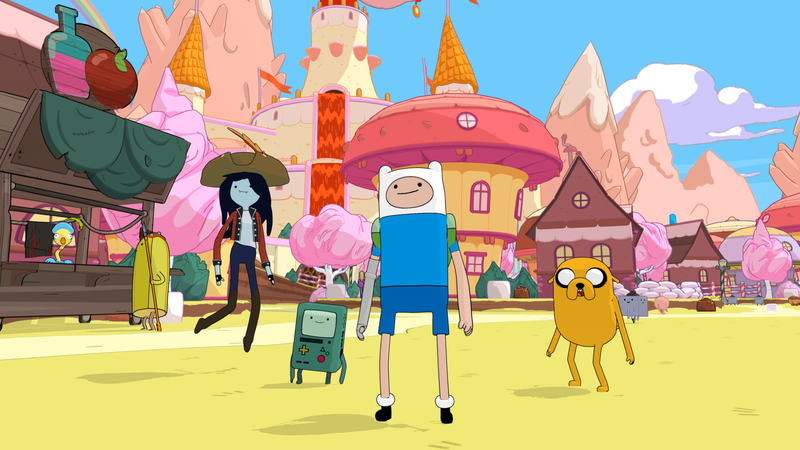 WP: You’ve announced multiple playable characters from the Adventure Time universe, are they going to be freely playable throughout or only show up at certain times? OA: There’s a core of playable characters you’ll be adding to your party and controlling from that point on, and many other non-player characters who help you out along the way. WP: What can we expect from the combat? Is it turn-based or real-time? And roughly how much time can we expect to spend fighting bad guys vs exploring the world? OA: I can’t really say anything about combat just yet, but rest assured there’s plenty of exploring as well as whooping bad guy buns. WP: Tell me about the process of adapting a world that currently exists in 2D to a fully-3D space. Did the decision to submerge most of Ooo factor into the challenge of designing a game set in such a large space? IH: We wanted to make the world as large as possible and have the locations geographically correct. To navigate around a world this large we would need some kind of vehicle for the party to use and interact with. We also wanted the story to have some kind of huge impact to the land of Ooo like a giant flood for example, so that’s where the boat idea came from! After that we looked at maps of Ooo to decide what would be seen after a flood and that’s how we choose the different locales in the game. WP: You’ve got the voice actors from Adventure Time doing all-new lines for the game, how about the music? Is it all original or made up of tracks from the show, or a combination of both? CJ: A mixture of both. All of the exploration tracks (E.G. when you are walking around the Candy Kingdom, Evil Forest etc) are original pieces composed in-house for the game. 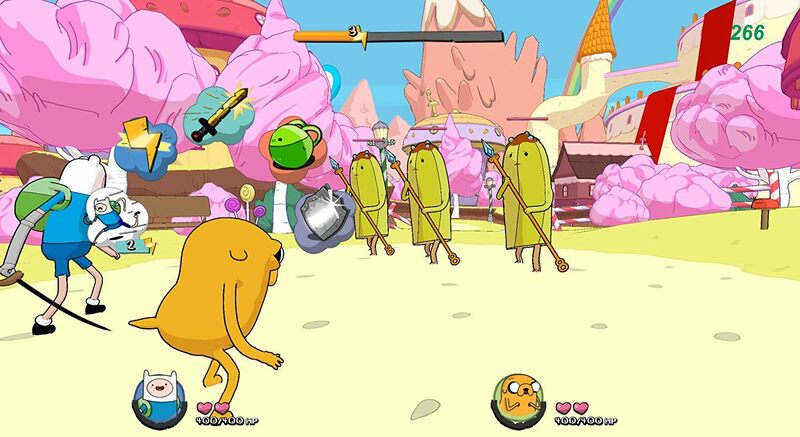 The combat tracks are created from existing Adventure Time tracks. There was no initial plan to split the tracks up in this way – it’s just how it worked best. When composing the original tracks, we paid very close attention to the style of Adventure Time, but at the same time we wanted ours to have a bit of a unique feel about them. Overall I think we got the balance pretty spot on. The exception to all of the above was the Theme track – it was a mixture of both. We wanted it to start with the usual beginning of the Adventure Time theme, but to then morph into a swashbuckling pirate epic, kind of mirroring the way Ooo transforms in the game. WP: Finally, who’s the biggest Adventure Time geek on the team and what juicy secrets can they tell me that’ll get me even more excited to play Pirates of the Enchiridion? IH: One of the level designers is a huge fan of the show! He’s hidden something secret in one of the levels for people to find while they go exploring. Even though the team knows what it is, he’s not told anyone where it’s hidden. So far only the Design Director has found it. WP: Thank you very much for your time, I’m counting down the days until release! 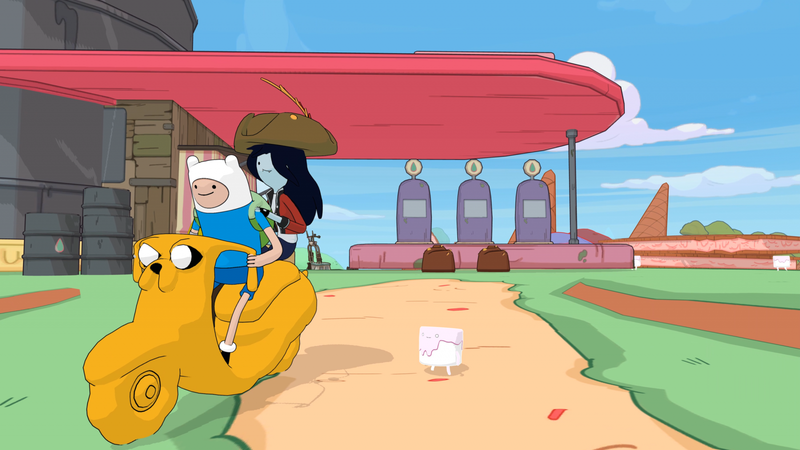 Adventure Time: Pirates of the Enchiridion releases on April 24 for the PlayStation 4, Xbox One, Nintendo Switch and PC.